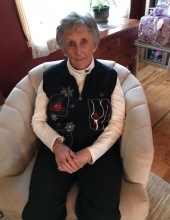 Velma Jean Klenke, age 81 of Darlington, WI passed away Thursday, March 28, 2019 at UW-Hospital in Madison due to a respiratory illness with her loving daughters Debbie and Doreene by her side. She was born December 17, 1937 in Alamosa, CO the daughter of James and Leona (Welch) Haws. Velma graduated from Alamosa High School in Alamosa, CO. She lived in Colorado until 1955 when she moved to Scales Mound, IL later to Apple River, IL and Warren, IL area. She moved to Darlington in 1979 where she has resided since. Velma had numerous jobs which included being a hostess, waitress, factory worker, a ticket reservationist, and a farmer for 29 years. Velma was an honorary member of the Blue Bird Society in Darlington. She enjoyed playing bingo with her daughter Doreene, playing cards, bowling, painting ceramics, and watching the birds. She cherished the time she spent with her family, especially her grandchildren creating memories they will all remember forever. She will be sadly missed and fondly remembered by her family and friends. A funeral service will be held Tuesday, April 2, 2019 at 11:00 A.M. at Erickson Funeral Home (508 Main St., Darlington) with Cliff Klenke officiating. Burial will be in Scales Mound Cemetery. A visitation will be held Monday, April 1, 2019 from 4:00 P.M. until 7:00 P.M. at Erickson Funeral Home and on Tuesday from 10:00 A.M. until 10:45 A.M. at the funeral home. Online condolences may be expressed to the family at www.ericksonfuneralhome.com. For those who prefer, a memorial fund has been established in Velma’s name. To send flowers or a remembrance gift to the family of Velma J. Klenke, please visit our Tribute Store. A visitation will also be held Tuesday, April 2, 2019 from 10:00 A.M. until 10:45 A.M. at the funeral home in Darlington. Memorials may be written out to "the family of Velma Klenke"
"Email Address" would like to share the life celebration of Velma J. Klenke. Click on the "link" to go to share a favorite memory or leave a condolence message for the family.